Shopper Marketing work one can be proud of! Steamers have been used in restaurant kitchens for decades. Lately Miele® and Gaggenau® offer these appliances for upscale home installation. 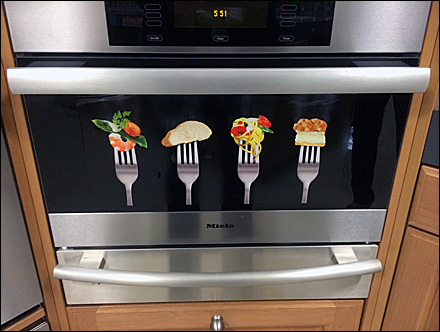 This Miele point-of-purchase was excellent showing the temping dishes that can be produced outside, with surprise POP inside, offering verbal benefits once you open the door. QR is provided so you can explore the subject in depth. Wall- and Table-top Steamers are both available, with you-fill or completely plumbed water supply. But I suppose I only parrot what the QR could tell you much better. I’d opt for plumbed in water and waste lines if you can afford. This entry was posted on March 24, 2014 by thebuystories in insights, Shopper Marketing and tagged Miele® Sales Pitch Inside and Out.